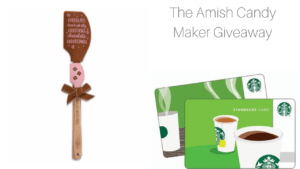 I am happy to be participating in this blog tour with a review and a giveaway for The Amish Candy Maker by Laura V. Hilton. Enjoy my review and don’t forget to enter the giveaway. Isaac Mast is on the verge of leaving the Amish church. He’s become a sought-after auctioneer and has a thriving business, but he feels confined by the strict rules. When his brother is severely injured in a wild-fire, Isaac receives a letter from his sister-in-law, begging him to come to Mackinac County to help out while his brother is hospitalized. Isaac agrees but is unsure how to manage their young children when he has weekend auctions he’s expected to attend. 5 Stars – ⭐⭐⭐⭐⭐ This is a new author for me, but she is now one that I will be checking out her backlist, especially the first book in this series, Firestorm. I loved the character of Agnes Zook. She was a strong woman who had endured a lot of hardship in her short life. Living in Mackinac County in the Upper Peninsula of Michigan, the Amish District has recently survived a terrible Wildflower that killed and/or seriously injured many, with several homes being destroyed. Resigned to being a spinster, she needs a way to support herself, thus the opening of her Candy Shop. She has no filter, so says what she is thinking, often getting herself into trouble. She also wears her heart on her sleeve and everyone can see what she is feeling just by looking at her face. When Issac Mast stumbles into her store, they have an immediate connection. He is another wounded character who plays the field, is a terrible flirt, yet guards his feelings. From their first meeting, I was rooting for these two to get together. Issac’s nieces and nephew were adorable. As children do, they love deeply and become very attached to both Onkle Issac and Agnes, even calling her Aenti Agnes. It takes a while to find out what happened in Issac’s past to cause him to become estranged from his family, but as it is revealed, my heart broke for this man. I have read many books about Amish couples and romance, but Bishop Miah (Jeremiah) was different from any I have come across. He was their spiritual leader, but he was a caring and highly intelligent man. It was almost like he could read their minds. He carefully leads Agnes and Issac towards each other, with them thinking he is actually trying to keep them apart. Throw in some jealous females, a few farm animals, an armed thief and several roadblocks and you have a wonderful Amish Romance. I really enjoyed this story and definitely recommend it to any Romance lover, as well as those who enjoy Amish stories and/or Christian stories. 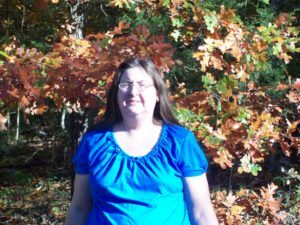 About the Author: Laura Hilton is a member of the American Christian Fiction Writers and is a professional book reviewer for the Christian market, with more than a thousand reviews published on the web. Her first series with Whitaker was The Amish of Seymour, comprising Patchwork Dreams, A Harvest of Hearts (2012 Laurel Award winner, first place in the Amish Genre Clash), and Promised to Another; and her second was The Amish of Webster County, comprising Healing Love, Awakened Love, and Surrendered Love. Her next series was The Amish of Jamesport, featuring The Post Card, Snow Globe, and The Birdhouse. Her latest books include The Amish Firefighter, The Amish Wanderer, and Love By the Numbers. Laura and her husband, Steve, live in Arkansas with their five children, whom Laura homeschools. You are very welcome. It was a wonderful book and I am so glad to have been able to participate in this blog tour. 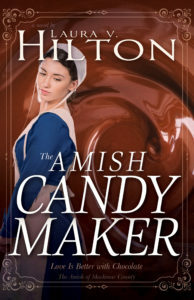 Thank you for your review on “The Amish Candy Maker” by Laura V. Hilton and for being part of the book tour. LOVE this author’s books and have wanted to read this book since I first read about it. Sounds amazing! I can’t wait to travel to Mackinac County through the pages of this book and read more about Agnes Zook and Isaac Mast. I am sure you will enjoy this one Kay. Thanks for stopping by. It really was a good story. I am looking forward to reading this book! I love reading about new places and new Amish settlement areas especially. Add in strong characters and this book is sure to be a great read! Thank you for this opportunity. I have read some of Laura Hilton books, however I have not read this one yet. Good luck. I hope you get a chance to read this one. Would enjoy reading this book to see what happens. It is a good one Vivian. Being so close to Michigan there is a certain familiarity for me as well, but I still would have enjoyed it. I love stories about the Amish! This sound so good. I visit there twice a year. Thank you! It is a genre I have come to really enjoy.